Scroll down for links to news articles and inside gossip.This log goes back in time, with newest entries at the top. Save the Delta Queen Campaign web sites:steamboats.org *save-the-delta-queen.org *savethedeltaqueen.com. Please send information to Steamboats.com and we will post your notice here. Anothersite to buy and sell paddlewheel boats: eBay.For other news (besides the Delta Queen) click here. For theLatest News archives and internal search engines click here. Bookmark this page and come back for Delta Queen updates. . . .
Congressional supporters of the Delta Queen, which offers the last overnight steamboat cruises in the country, will have to wait a while longer to try to get a new federal exemption for the historic vessel. The ship needs an exemption from some federal fire regulations because the superstructure is built of wood, and the vessel carries more than 50 passengers on overnight trips. The Delta Queen has had exemptions for years. But a new one may be a problem because key lawmakers, including Rep. James Oberstar, D-Minn., chairman of the House Transportation and Infrastructure Committee, have safety concerns. Backers of the Delta Queen, including Whitfield, intended to propose an amendment providing for the exemption in the Coast Guard reauthorization bill, originally scheduled to come up on the House floor last week. But scheduling problems have now put the Coast Guard measure off until after the Easter congressional recess, according to transportation panel spokeswoman Mary Kerr. The recess runs from March 17 to 28. Whitfield has said that the Delta Queen is safe and its visits are important to the economies of communities along the Ohio River. And, of course, the Delta Queen races the Belle of Louisville every year at Kentucky Derby time. But Yarmuth and Hill have doubts about the exemption. "We're hopeful that a compromise can be reached and want to see the Queen racing every year," Yarmuth spokesman Stuart Perelmuter said. "The experts are telling us that people's lives are at risk on overnight cruises, so unfortunately we cannot support a measure that exempts these types of cruises." Katie Moreau, spokeswoman for Hill, said, "Baron has serious reservations about granting the Delta Queen an exemption from the federal fire regulation primarily because the U.S. Coast Guard adamantly believes it is unsafe." "That said, Baron knows how passionately folks feel about the Delta Queen, not only for its historical significance but for its tourist appeal," Moreau said. "And he will take all those factors into consideration when a vote on granting the exemption comes to the floor of the House." FYI--The Kentucky House of Representatives unanimously passed HR 109 on Thursday March 6, calling for the U.S. Congress to extend the exemption of the Delta Queen from the Safety at Sea Act. Editor's Note: Now we just have to get the federal House and Senate to listen! "United we stand, divided we fall," as they would say in Kentucky.Call your people in Washington - tell them the Bluegrass State is calling on themto do the right thing and save the Delta Queen! Last fall I sent to you copies of an on line petition being signed by folks from all over the world who are pleading to SAVE THE DELTA QUEEN. I have taken the time to print it out and have also taken the time to mark the folks from Minnesota who have signed it since that envelope arrived in your office last fall. They number 79. I have also taken the time to note that folks from 49 of our states have signed it along with folks from 7 foreign countries. These are folks that feel strongly about our heritage and love of history. If you would read these entries you'll also see these are folks that feel like we have too much government. Mr. Oberstar, I would like for you to understand that as Americans we feel like we have a hand in how our government is run. From what I have been able to determine you have been in Washington for a very long time. It appears that the ugly head of power has overtaken your good sense. I have been able to read from various websites the amount that you receive from the unions. It appears you have taken a personal vendetta against Majestic America Line for not hiring union members in the spring of 2007. It is beyond my imagination that someone in your place would put the good of a union over the history of United States by allowing the exemption to expire on the DELTA QUEEN. She has done no harm. As a matter of fact by not allowing her to run you are putting common folks out of a job not only on the boat, but the many towns and cities where she travels and the suppliers who furnish her needs. With all of the woes our country has at the moment I would think that you should have more important things to do. To hide behind the safety issue is just plain chicken. As has been noted Presidents and many famous people have ridden on the DELTA QUEEN over the years. We all know that the law was not intended for her. She never goes to sea. She has the latest and greatest of all fire safety features available. And by preaching that she is a fire hazard you are saying that all past Congresses have been wrong in their vote to grant her the exemption. Mr. Oberstar, I've always heard that those highest up fall the hardest. You still have time to clear your conscience and make another about face and allow the exemption to be granted. We have seen through your smoke screen and I only hope to heaven that your advisors convince you to allow this exemption to go through. By being so adamant about this you are also making it difficult for other junior Representatives to hold onto their seat in the House. I personally have started campaigning against the one in my District who has been brain washed to think he has to keep friends in Washington over and above what his constituents back home have been telling him they want - namely over 1,000 signatures from his District asking him to SAVE THE DELTA QUEEN! There is still time. Do the right thing! SAVE THE DELTA QUEEN!!! A Note to All Delta Queen Supporters! I suggest that all supportes of the Delta Queen, send a letter to the Editor of all of the Minnesota Newspapers. Let the people in all of these cities get an influx of letters, telling about how Oberstar is trying to kill a piece of history, which would be the same as tearing down the Statue of Liberty, cutting down the Giant Redwoods of California, or perhaps having the President live in a double wide trailer, because the White House was torn down. As far as safety is concerned, if the Delta Queen were to sink and you were on the Cabin deck, you would probably never get your feet wet. As far as fire safety is concerned, she is far safer that most Motels in this country. They too are made of wood, with one elevator, and sometimes only one stair case. Is it safer to jump a floor or two on concrete if you are trapped in the hotel, or step outside with a Life Preserver and jum in the River? Many of these people will be put out of jobs, it will hurt the already depressed economy, of the Cities and Towns where she stops for a visit. This is aviable part of our American Heritage and our history, and she is being subjected to this threat because of lobbyists for the American Unions. This proves that Congressman Oberstar is NOT there to do what is best for his Country, but instead he is there to do what is best for his pocket and his re-election fund, taking money from the Union Lobbyists. This man needs to be replaced. He is no better than a United States Representative taking bribes, it is basically tyhe same thing. People should go to http://www.mnnews.com/webs.html and click on the newspapers, and write them letters. This is an election year for all Congress people, and maybe we start a fight of our own. Let's get with it folks, write those letters, be creative, let the people of Minnesota know what kind of a leader they have, one who is on the take. Read original.Please go here and add your comments. Congressional supporters of the Delta Queen, which offers the last overnight steamboat cruises in the country, will have to wait a while longer to try and get a new federal exemption for the historic vessel. The ship needs an exemption from some federal fire regulations because the superstructure is built of wood and the vessel carries more than 50 passengers on overnight trips. The Delta Queen has had exemptions for years, but a new one may be a problem because key lawmakers, like Rep. James Oberstar, D-Minn., chairman of the House Transportation and Infrastructure Committee, have safety concerns. Backers of the Delta Queen, including Rep. Ed Whitfield, R-1st District, intended to propose an amendment providing for the exemption in the Coast Guard reauthorization bill, originally scheduled to come up on the House floor this week. Whitfield has said that the Delta Queen is safe and its visits are important to the local economies of communities along the Ohio River. And, of course, the Delta Queen races the Belle of Louisville every year at Kentucky Derby time. But Reps. John Yarmuth, D-3rd District, and Baron Hill, D-9th District, Indiana, have doubts about the exemption. "We're hopeful that a compromise can be reached and want to see the Queen racing every year," said Yarmuth spokesman Stuart Perelmuter. "The experts are telling us that people's lives are at risk on overnight cruises, so unfortunately we cannot support a measure that exempts these types of cruises." Katie Moreau, spokeswoman for Hill, said "Baron has serious reservations about granting the Delta Queen an exemption from the federal fire regulation primarily because the U.S. Coast Guard adamantly believes it is unsafe." "That said, Baron knows how passionately folks feel about the Delta Queen, not only for its historical significance but for its tourist appeal," Moreau said. "And, he will takeall those factors into consideration when a vote on granting the exemption comes to the floor of the House." * The Delta Queen undergoes thorough Coast Guard inspections on a quarterly basis, in addition to unannounced visits at the Coast Guard's discretion - resulting in inspections at least six times a year. * In sensitive areas the wooden superstructure, including overhead beams and the boat's roof, have been replaced with fire-retardant or fire-resistant materials. Special fire-resistant paints, developed by NASA, have been applied to some exterior surfaces. * The Delta Queen is outfitted with the latest fire detection and suppression systems, mandated by the Coast Guard and installed in accordance with their specifications. Fire, smoke, and heat detectors and sprinklers are located in every room on the boat. * There are fixed CO2 fire suppression systems for the liquor locker, generator rooms, boiler room, and bowthruster room. The boat has emergency ventilation shut-offs, and there are fire extinguishers and fire stations, complete with fire hoses and nozzles, located at close intervals throughout the vessel. * All licensed deck and engineering officers have completed advanced fire fighting training at USCG-approved training facilities and receive periodic refresher training. * All crew members undergo extensive fire prevention, fire safety, and fire fighting training conducted by professional, Coast Guard-approved instructors from the Washington State Fire Academy. * All crew and passengers perform weekly fire and abandon-ship drills in accordance with federal regulations. * Evacuation slides are located on both sides of the boat to facilitate rapid evacuation. * The Delta Queen has an inherently safe design with almost every room opening directly onto an outside deck. The few interior rooms have exterior windows, are no farther than 20 to 30 feet from an exit, and each one opens into a broad salon, not a hallway. * The Delta Queen cruises only America's rivers and is never more than a minute or two from shore. Like all steamboats, she was designed with the capability to land just about anyplace along the river. In the case of a medical emergency, the crew can quickly get the victim to safety wherever there is a nearby road to accommodate an ambulance. Reported Safety Incidents:There has been one reported incident on the boat in recent years: In 2003 a sterno can, which heated a chafing dish on a dining table, fell over onto the table cloth. The flame was extinguished instantly, with no resulting damage. Sterno burners have been replaced with electric chafing dishes. 03/01/2008 - Feeling confused about the Delta Queen situation, I turn to Franz Neumeier's site,http://www.save-the-delta-queen.org/,where he explains exactly what is going on. The House Transportation Committee is still stallingthe Delta Queen amendment. It got our goats yesterday, but today we are back to our missionto preserve the Delta Queen. She has always been exempt from this law. Why all of a suddendo they want to rub the poor boat's nose in this law? This has been a long standing Americantradition to exempt the boat from this law. Didn't anybody learn anything from the 1970campaign? Our right to the Delta Queen as a working landmark and living national treasurewas hard-won in 1970 by the People. We stood up and said - clearly - that we want the DeltaQueen to be exempt from that law. Why does history have to repeat itself? Why is the DeltaQueen again caught up in this controversy? The boat is not a bargaining chip. Pleaseread Franz's analysis and then decide whether it is time for you to call up your electedofficials, write letters to the media requesting information about this, and blog youropinion on the Delta Queen articles published on the Internet. Just Google "Delta Queen" atnews.Google.com. At the bottom of eacharticle is a place to add your opinion (you may have to register at the site, but it onlytakes a few minutes). First, read thelatest news on the Save the Delta Queen campaign at Save-the-delta-queen.org (click here)"Delta Queen: a public and political affair?" March 1, 2008. My name is Jay Webster and I worked in the Marine Operations Department, for the Delta Queen Steamboat Company, from 1994 to 2001. I recently heard about the trouble the Delta Queen is in. I've looked over the website and I don't see any of the facts about the vessel's fire fighting capabilities. Things have changed since 2001 and I'm sure that a lot of the people, with this same knowledge, have moved on. I'm not sure how to get this information to the people who can use it, so I hope you can help me. 1. Combustible Removals: During annual "lay-ups", a regular program was planned and executed, where wood was removed and replaced by structural steel. Anywhere wood didn't effect passenger appreciation, it was scheduled for removal. 2. Sprinkler System: The old fire fighting "Sprinkler System", was originally installed in the '30's, was "Grandfathered" and was legally acceptable for use. This system was removed and replace by a new system in compliance with the NFPA 13 and all current Federal requirements for wooden structures. 3. Fire Detection System: A state of the art, MXL fire detection system was installed, to replace the Pyrotronics System 3 that was already on board. Both system are still accepted by the US Coast Guard for use on board ships, but the MXL system is an "intelligent system", that can distinguish between calls from smoke detectors, heat detectors and a manual pull station. This gives the fire fighters real time information, to help them fight the fire more efficiently. I think that the MXL system is one of the best systems on the market today. 4. General Alarm and Public Address System: Hose-McCann's current GA/PA system was installed. This system is currently what is being installed on the US Navy's newest ships. It far exceeds the requirements for the Delta Queen, but it's installation was part of the company's plan to bring her into the next century. On a personnel note, I hold a US Coast Guard license for unlimited horsepower, as a chief engineer for steam, motor and gas turbine vessels. I am a graduate of the New York State Maritime College and have a Bachelor's of Engineering degree, in Marine Engineering. I have almost thirty years experience in the marine industry and would be willing to argue with anyone about the operational readiness of the Delta Queen. Professionally I have moved on, but I am proud of the work I did while at American Classic Voyages. I am presently responsible for the maintenance, for a fleet of survey vessels, operated for the US Naval Oceanographic Service. I hope this helps. If there is anything else I can tell you, please feel free to contact me at 850/525-3830 or jwebster@horizonlines.com. - The DQ got a completely new sprinkler system some time after 2000, so it's really absolutely new, including all pipes etc. The system was planned by a well known and reputable sprinkler installation company called Quality Fire Protection systems in Harrahan, Louisiana. Delta Queen system was designated "Ordinary Hazard" by the Coast Guard which meant that they had to utilize larger sprinkler head orifices and higher pump flow capacity that the American Queen! Therefore the Delta Queen sprinkler system pushes more gallons of water per minute than that on the American Queen, because the AQ utilizes smaller sprinkler head orifices (7/16 of an inch verses 1/2 inch on the Delta Queen). The DQ recieved complete United States Coast Guard Approval for the Delta Queens sprinkler system, as well as for the mandated and newly installed fire and smoke detection system. - The smoke and flame detection system is exactly the same as the one on the American Queen, an MXL Cerebrus Inteligent system that is tied and operates in conjunction with the sprinkler system and the fire/smoke detection system. The points to be made The Delta Queens Smoke and fire detection systems were mandated, installed to their requirements and approced by the Us Coast Guard. The Delta Queens sprinkler system was mandated, installed to their requirements and approved by the US Coast Guard. These systems are far superior to that on the Mississippi Queen! There has been significant reduction of the vessels fire load as mandated by the Coast Guard, with any modifications being done with Coast Guard approved materials and documented submittals and approval (The entire main deck bow was converted from wood to steel, most Texas and Sun deck cabin bathrooms were torn out and redone with Coast Guard approved fire proof materials, the upper fire room over heads were completely wrapped in fire proof insulation). - The continues to be a documented regimen of fire fighting training for the crew in compliance with all Coast Guard regulations, the vessel is inspected 6 or more times a year. - There is NO fire-retardant paint on the whole boat! Obviously this paint has been removed in the 70s already. The paint used since then obviously is regular enamel paint for the bulkheads and water-based paint on the decks. I'm working on finding out what exact type/brand of paint is being used today. fire suppression system Pro-MXL model 511C with SGB-32C back box. I keep seeing type of service PSD. There are 52 manual pull stations at that time, and 10 audible and 10 visible alarms. I'm not sure what the latter refers to. I know that when any smoke, heat or fire alarm is set off, a loud alarm goes off in both the pilothouse and engineering, and the response is immediate (having witnessed it myself from both places). 2 50# CO2 cylinders covering fire/boiler room (hosereel). The firefighting system is pressurized hoses, I think set to 130 psi. The firefighting team goes through complete drills every few weeks, minor ones more often. Of course, the entire boat does fire and boat drill once a cruise. In addition, all of us are receiving more firefighting courses this season, but I have not been on while the training has taken place, so I'm not sure of the extent of it. These have been with special marine firefighters brought in by the company for a week or two at a time. Crew quarters is no different than passenger cabins -- same smoke, fire and heat detection systems. Fixed CO2 fire suppression system for liquor locker, generator rooms, fireroom (boiler), bowthruster room. Boat is equipped with emergency ventilation shutoffs. Delta Queen is equipped with numerous fire stations consisting of fire hose and nozzle. Sprinkler system--one sprinkler pump and compressed air maintain 140 ready pounds of water pressure. Sprinkler heads are located throughout the boat. Portable fire extinguisher are located throughout the boat. The old system could only locate a problem in a zone on the boat. A search was necessary to find the exact location of the probelm. The MXL Cerebrus Intelligent fire/smoke detection system has each sensor networked to the central station. Every sensor is individually address and queried every few seconds regarding it's status. They are able to detect smoke and excessive rate of temperature rise. An alarm indicates the exact location of the problem, allowing personnel response in seconds rather than minutes with the old system. It also monitors the sprinkler system, sounding an alarm if it detects, flow, pressure drop, trouble or tampering. When the old officer's quarters on the Sundeck were eliminated, all the new construction there was of metal studs and fireproof sheathing. Te dining room walls and ceiling are also sheathed with fire proof materials. Later, steel internal structure was added to ALL decks of the boat from the stack forward. Because all this is covered with historically appropriate materials, this is not apparent to the casual observer. The galley is walls and ceiling are entirely sheathed in heavy gauge stainlees steel with conventional sprinklers. All the ranges, ovens and fryers are under a stainless steel ventilating hood. The hood and associated exhaust duct have an independent chemical fire supression system.It's discharge will also trigger an alarm. Visible alarms are rotating red beacons in engineering and machinery spaces that alert personnel to an alarm despite high ambient noise levels. All of the spaces where petroleum fuel is used are protected with their own independent CO2 systems (generator pods and boiler room). The liquor locker is protected because of the ethyl alcohol content there. There are two (2) separate, independent systems referred to here, the automatic sprinkler fire supression system and the hose station fire fighting system . The sprinkler system always contains water at 140 psi. It has pressure tanks containing 600 gallons of water instantly available should a sprinkler head trip. Any flow or pressure drop in this system triggers an alarm and automatically starts the high capacity sprinkler pump to maintain pressure in the system. The hose station system always contains water but is not normally pressurized. When an alarm is received for any reason, watch personnel start one of the three fire pumps before the actual cause of the alarm is known. If investigation of the alarm proves it false, the fire station pump will be secured. Sprinkler system--one sprinkler pump and compressed air maintain ready at 140 pounds of water pressure. If necessary, valves allow any of these pumps to be manually connected to any system that requires extra capacity in an emergency. For a city that owes its existence to the Mississippi River, St. Louis has paid surprisingly little attention to the drama surrounding the Delta Queen, the storied steamboat whose visits to our riverfront always recall an earlier, more glorious time. How to describe the Delta Queen? Let travel writer Arthur Frommer do it. Last October, he wrote, "For 80 years, the Delta Queen has been the elegant grand dame of a cruise boat, equipped with teak handrails, brass fittings, an ironwood deck, Tiffany-style stained glass and that giant spinning red paddlewheel at the back. Her landings are still sounded by the very bell that was on the steamboat Mark Twain rode downriver in 1883. The Delta Queen is a true piece of American history, a registered National Historic landmark, and the last original steamboat still offering overnight cruises in America. She was built in 1926 with a steel hull and wooden superstructure - and therein lies the problem." In 1965, 90 people were killed when the Yarmouth Castle, a multi-wooden-decked boat, caught fire on a cruise from Miami to Nassau. Two years earlier, 125 people were killed when a Greek ship caught fire off the Canary Islands. These disasters prompted Congress to pass the Safety at Sea Law, which essentially bans overnight cruises for ships made primarily of wood. Supporters of the Delta Queen have managed to get exemptions for the steamer ever since, but its latest exemption runs out in November and efforts to extend the exemption have so far come to naught. One of the chief opponents is Rep. James Oberstar, D-Minn. He is chairman of the House Transportation and Infrastructure Committee. "Congress would never exempt a particular 747 aircraft from FAA safety standards, and we should not exempt a passenger vessel carrying hundreds of sleeping people from Coast Guard safety standards," he told a reporter last year. The latest effort to save the Delta Queen involves adding the exemption in an amendment to the Coast Guard Reauthorization Bill. The House Rules Committee is supposed to consider this on Tuesday. One St. Louisan who is paying attention to this story is Jim Blum. He is a civilian employee of the Coast Guard. He is a supervisor in the licensing office. He is also a former captain of the Delta Queen. Actually, the person in charge of the steamboat is not called the captain. He is called the master. I visited the former master at his home in south St. Louis on Sunday. Is the Delta Queen safe? "She's perfectly safe," he said. Blum grew up in Cincinnati, which was then the home city of the Delta Queen. During a summer break from Xavier University, he got a job on the steamboat - and that was that. "Once the river gets in your blood, you can't get it out," he said. That first summer, he worked on a cruise to Minneapolis. He got his degree in business, and went right back to the steamboat. He worked in the purser's office, and part time in the gift shop. He could have made more money on land, but money wasn't the point. In the early spring, the steamboat headed down the river to New Orleans and Mardi Gras. It cruised the Mississippi, the Tennessee, the Ohio. Blum earned his license as a steamboat mate, and then became a pilot. In 1973, he came to St. Louis to work as a pilot on the Admiral. In those days, she was a sidewheel steamboat. She was confined, of course, to day trips. Still, Blum was on the river. And he married Annie, who also worked on the Admiral. Then they went to Louisville, where he worked on the Belle of Louisville and then finally back to the Delta Queen. He has also served as the master of the Mississippi Queen, and he has worked for towing companies, but he makes it clear that the Delta Queen has a special place in his heart. Of course, safety is important, he said, but he talked about the sprinkler system and the special paint, the steel hull. She's safe, he said. There is another argument that supporters of the Delta Queen sometimes make. Nobody has to take a cruise on it. It's not public transportation. Shouldn't one be allowed to use one's own judgment? Somehow, though, that seems like an argument from another time, a more romantic time, a time when steamboats used to regularly call on the St. Louis riverfront. The Delta Queen's fate is in the hands of 13 people. We must reach them by Tuesday, February 26th. Please help! For the first time in this Campaign, legislation to save the Delta Queen could go before the full House of Representatives next week -- but only if the House Rules Committee approves an amendment to the Coast Guard Reauthorization Bill that would continue the boat's exemption from the 1966 Safety at Sea Law. The Committee will meet the afternoon of Tuesday, February 26. If you have not done so already, please contact the members of the Rules Committee (listed below) and urge them to approve Congressman Steve Chabot's amendment to the Coast Guard Reauthorization Bill, H.R. 2830. And even if you have done so, please contact your own Representative and ask him or her to vote in favor of the amendment when and if it reaches the House Floor on Wednesday, February 27. And ask everyone you know to do the same. The effort to save the Delta Queen steamboat is getting a boost from Congressman Steve Chabot of Ohio, who plans some legislative hijinks next week on the boat's behalf. Chabot plans to introduce a "Save the Delta Queen" amendment to a Coast Guard Reauthorization Bill coming to the floor of the U.S. House of Representatives. The amendment will call for the continuation of the historic steamboat's long-standing exemption from fire safety rules. The exemption expires in November, and without it, the boat will have to stop sailing. Congress has granted the Delta Queen an exemption from the 42-year-old safety rules nine times in the past, nearly always by close-to-unanimous margins. But the chairman of the House Committee on Transportation, Rep. James Oberstar of Minnesota, has been blocking a further exemption, calling the boat a fire hazard. Built in 1926, the 174-passenger Delta Queen is the last operational river steam paddlewheeler with overnight accommodations in the United States, and it has a strong following among riverboat lovers. The four-deck, white-washed confection, which resembles a giant wedding cake, harkens back to a bygone era with its stately wooden cabins; cozy, hardwood-paneled public rooms; and rare Siamese ironwood floors. But it is precisely these historic charms that are causing the downfall of the paddlewheeler, since they do not meet modern fire safety standards that forbid wooden superstructures on boats that carry more than 50 passengers on overnight trips. Last October, Congressman Chabot introduced a stand-alone bill, H.R. 3852, that would extend the Delta Queen's exemption from the fire safety rules until 2018. But that bill remains stuck in the House Committee on Transportation because Oberstar refuses to release it for a vote by the full House. The ship's owner, Majestic America Line, already has announced that the boat's final cruise will take place in November. Editor's Note: Forty-seven people have already commented on this subject at USA Today.Please log on and join the discussion. Post your thoughts on savingthe Delta Queen click here. The Safety at Sea Act and SOLAS (Safety of Life at Sea) technically are two very different things. But on the other hand they're working hand in hand against the DQ. SOLAS is an international treaty (therefore no a directly effective law in the US) and hence of course not identical with the Safety at Sea Act that directly effects the Delta Queen being US law. But still SOLAS is the problem, as the Safety at Sea Act in Sec. 1 (c) says that the Safety of Life at Sea (=SOLAS) in the version of 1960 plus some amendments made in 1966 is setting the standard for the Coast Guard to decide about giving a certificate of inspection or not. As SOLAS describes the rules about wooden superstructure and other things, the Safety at Sea Act makes SOLAS directly effecting the Delta Queen. That's why the Congress needs to exempt the DQ from the Safety at Sea Act to prevent SOLAS 1960/66 from being effective for the DQ. At least and fortunately, it's still the 1960/66 version of SOLAS, as from the actual version of SOLAS the DQ won't have even the slightest chance to pass. Some of the folks I sent the email about the Steamboat Wharf Stories said they had a hard timingconnecting. You might want to try http://www.rrecord.com/�that is the Rappahannock Record on-line main page. From there you can click on Steamboat WharfStories. If you still have a problem and are still interested you might try Googling RappahannockRecord and linking to the on-line newspaper that way. The stories are changed each week. 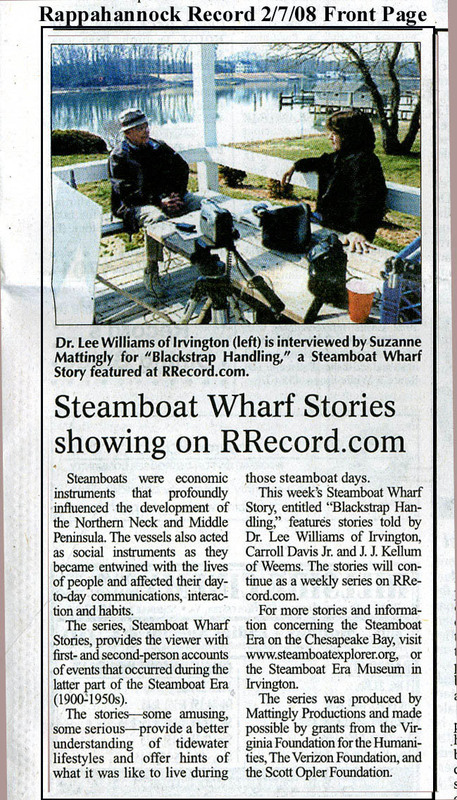 By going to the main page of the Record you can then click on the Steamboat Wharf Stories link. 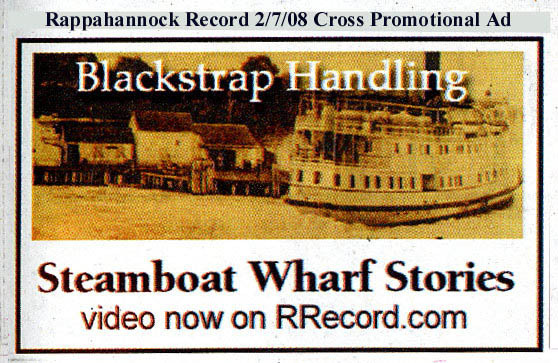 The Rappahannock Record newspaper has provided us with� an article and a cross promotional ad for the Steamboat Wharf Stories (see attached). Hi, can you give me any information about Capt. Wagners family? The reason I ask is because my Aunt found his name and number in an old address book of her mother Martha [Schwartz] Wagner. [my grandma] and we were wondering if we might be related to him? Martha was married to a Joseph Wagner whom she met in 1924 in Oregon. She had relocated from Canada, and his family was from California. He died/or left when my Aunt was a baby and grandma never talked about him. We have a few pictures of Joseph but that's all. We thought maybe Capt. Wagner might be a brother, cousin, etc? Thank you for any help you can give me. If you don't know anything about his family maybe you know someone who does that you can give my e-mail addy to.